One of the most inexpensive must have items in my makeup kit is the Q-tip. I use them for makeup all the time! The cotton applicator and pointed shape make it perfect for cleaning up lines and makeup smudges. I prefer using Q-Tip...not generic cotton swabs. Yes, this does make a difference. Q-Tips have much more cotton on the tip which make it safer for use. You can definitely tell the difference. -Use it after filling in your eyebrows, a few swipes above and below the brow perfect the shape. Did you go overboard filling in the brows with too much color? Swipe the swab a few times over the brow to lessen the effect. -Clean up any smudges underneath the lower lashline...I often do this because I smudge shadow onto my lower lashline and a lot of times I need to thin it out. -Use it to clean up around the mouth when you're going for a strong lip color. A must have for the perfect red lip. -Use it to smudge eyeliner for a smokey eye. -Use a q-tip to apply pimple cream right on the tip of the zit...it makes it a lot more precise and sanitary. I love doing this with my Mario Badescu drying cream. -Clean up nail polish around the fingernail edges. Makes your nails look salon done! Those are only a few of the many uses. Recently, Q-Tip launched their new super cute vanity packs. 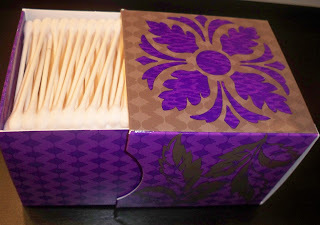 Suggested retail price is $3.19 for this beautifully decorated box of 285 cotton swabs. You no longer need to stash away this must have item in a drawer or linen closet. These vibrant vanity packs come in a range of colors that can match your colors and fit nicely on your vanity or right next to your bathroom sink. It has a slide out drawer housing the q-tips. They come in many different colors. This is an amazing idea when you think about it. I usually always spend at least $10 just to buy a fancy schmancy q-tip holder for my bathroom counter. This is a great alternative. 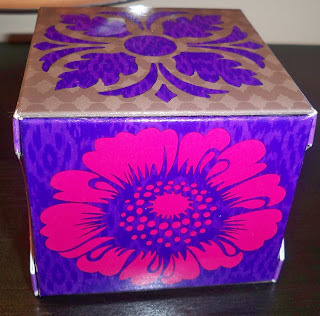 I'm pretty sure you can use this box after you're done with q-tips to hold other makeup items and necessities. Check them out at your local drug store. Those are really nice! This will be great since my hubby likes to leave the fug box all over the bathroom haha. At least it will be pretty! yes really cute.....its like what will they think of next? everyone loves the q-tip! hee hee! oh yeah you got it dead on, those long island girls...LOL! Very cute I have them in my fit at al times. Can't wait to see the cute boxes although everything takes longer to make it to Canada! So cute! I use Q-tips a ton too! These are too cute..I lot nicer than those boring blue packages with the back that never stays put! What a great tip! I personally like the Q-Tip brand better than generic too. Their quality is so much better. Those Q-Tip boxes are cute! ooh are u serious those are so pretty. my current plastic box is having a little color envy. Those new Q-tip designs are soo cute and decorative :] got to check it out next time I help out to Target. I love Q-tips for those easy fixs especially with smudges with makeup and cleaning up nail polish messes. Thanks for sharing!! oh wow, I must pick one or two of those up when I get paid. Those are too cute.